He arrived expecting to earn $200 a month, but he worked for eight years before receiving his full salary. With a wife and children to support, he took second jobs in a mirror and frame shop and in food dehydrating and ice-making plants, but he never complained. Although he hadn’t completed his doctorate, he taught a wide range of classes and earned the respect of his students. 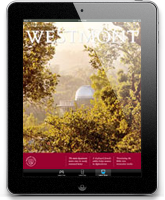 In other words, Paton Yoder displayed the diligence, dedication and sacrifice typical of the people who founded Westmont. For 10 years, he devoted himself, his talents and his family to the growth and development of the fledgling school. Arriving in 1940 as professor of history and chairman of the department, he taught most of the history courses in those early years and administered departmental affairs with dignity and compassion. His doctorate from Indiana University added prestige to the faculty, and he set a standard for professionalism. Students remember him as an inspiring teacher who prepared them well for graduate school. In 1946, Dr. Yoder became the first dean of the college. During the interim presidency of Elbert McCreery (1946-47) and the presidency of James Forrester (1948-50), he administered the day-to-day affairs of the college. His faithfulness helped the college endure during difficult times. This service to Westmont came at considerable cost and financial hardship. Yoder was the only faculty member with children who stayed beyond the first year; he was one of only five professors who taught for the entire first decade. Not only did he receive his salary irregularly, but it was considerably less than what he expected — what he had been promised. Even with the prestigious position of dean, he lived with his family in the gardener’s cottage at the lower end of campus. 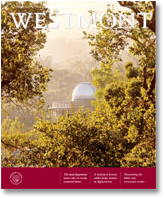 Although he left Westmont in 1950 to return to his Mennonite roots in the Midwest, he always considered Westmont his first love. “I feel good about my colleagues, about the camaraderie, the Christian fellowship, the spiritual sharing and the considerable spiritual growth,” he recalls. Yoder believes fellow faculty shaped, changed and enriched his views, especially his ideas of grace, forgiveness and love. In both his personal and professional life, Yoder did not seek prestige or recognition. His steadfast pursuit of knowledge and godliness encouraged others to entrust him with great responsibility. He served Westmont faithfully during the most difficult of times, and his legacy has inspired those who followed. Editor’s Note: This article is based on a history by Paul Wilt, professor emeritus of history and college archivist. 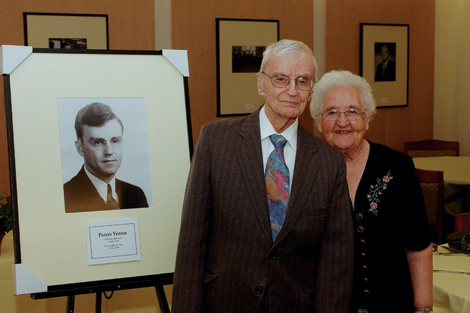 In April 2005, Westmont honored Yoder for his contributions at a special ceremony on campus.